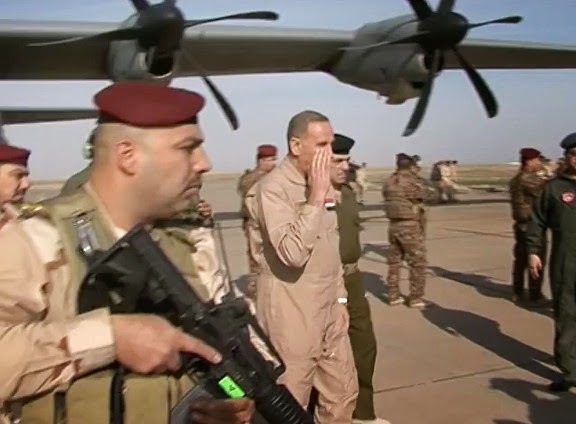 Still from an Iraqi MOD video posted 08DEC14 of Iraqi Minister of Defense Dr. Khalid al-Obeidi, seen saluting upon disembarking from IqAF Lockheed Martin C-130J-30 "Super Hercules" transport aircraft at Camp Speicher (ORSH). Interesting to see the Iraqi minister's adoption of tan CWU27/P nomex fire-retardant flight suit. He wears a distinctive ID patch marked "MINISTER.O.D". YouTube video posted 08DEC14 depicting Iraqi Minister of Defense Dr. Khalid al-Obeidi at this week's tour of recently liberated Baiji refinery and University of Tikrit. YouTube video posted 08DEC14 depicting Iraqi Minister of Defense Dr. Khalid al-Obeidi at this week's tour of Kadhimiya (northern Baghdad). During the last question posed by a member of the press, he is asked about Russian arms developments for Iraq. The minister responds "there's been a few complications regarding recent deliveries." Iraqi leadership reportedly told SecDef Hagel on Tuesday that their army is "taking the offensive" against the Islamic State group but needs more air power and heavy weaponry to prevail. Happy news. Iraqi government is taking back what rightfully belongs to the people. Everything north and west of Baghdad all the way to the Syrian border must be re-captured. Iraqi government should not settle with anything less than that. This can be done while respecting the Kurds. No more fighting between Arabs and Kurds. There shall be mutual understanding, stability, peace, and good relations between Arabs and Kurds in Iraq. And the military co-operation has so far payed off. The military help from Iran too has resulted in positive outcomes for Iraqi Security Forces and Army in certain engagements with IS fighters. 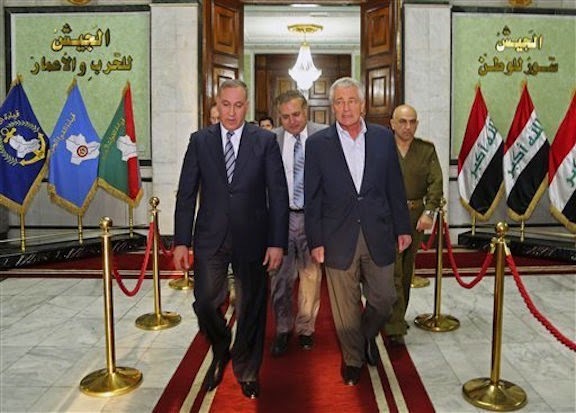 However Iranian involvement in Iraqi domestic affairs is like a double-edged sword. It has both positive and negative effects on the overall situation in Iraq. Iranian commitment is good in the way that Iraqi forces are provided with armaments, vehicles and various equipment which strengthens them in the fight against IS fighters. Simultaneously the Iranian meddling in the Iraqi political landscape is bad in that it disenfranchises Iraq's sunni Arabs, pushing many of them towards IS and other such groups.